In 1997, the nation’s factories produced a total of 16,462 tons of waste. It was about that time that the company, said John Bradburn, GM’s manager of waste reduction efforts, became curious as to what it would take to develop a landfill-free plant. The company had been tracking material usage at its various plants via a data collection program designed to help the factories become more efficient. It wasn’t until Bradburn realized that the company was getting close to zero that GM considered going for landfill-free facilities. “One day, I realized it—we could be landfill free,” he said. So he began an analysis of GM’s various facilities to find an ideal candidate to try out this landfill-free hypothesis. The Flint, Mich., plant won out because it had only a few waste streams left. After talking with engineers and suppliers to make the necessary changes, the plant went landfill-free in 2005. Seventy-six of the company’s 140 or so manufacturing plants and 10 of its nonmanufacturing are now landfill-free. 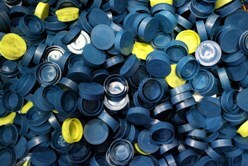 Combined they recycle 2.5 million tons of material annually. This includes materials such as paints or chemicals that are often difficult to dispose of, not to mention recycle. Paint thinners are one such item. To ensure paint lines are perfectly clean before switching paint colors, factories run a solvent through them to purge the last few molecules. Instead of disposing of the solvent, each plant sends the byproduct to a company in Michigan that recycles it and sends it right back GM plants for reuse. A total of 1.8 million gallons of the fluid go through this process each year. GM’s status as a multinational corporation, a liability in most environmental discussions, actually benefits the company here. It has the market heft to create demand for recycling services that previously did not exist, and so it has ended up creating a number of recycling companies specifically for its byproducts. When GM can’t recycle something, it combusts it for energy through a controlled burn in another facility with air permits that handles combustion of these types of materials. Bradburn said that converting its unused materials to energy is quite rare – less than 3 percent of by product materials go to energy production, and the company is aiming to reduce that number even further. Through its journey to decrease its waste, GM has learned to rely a great deal on new technologies its engineers develop. As part of EPA’s Wastewise program, the company has shared some of its recycling strategies and technologies with other companies, so that they, too, can reduce their waste.